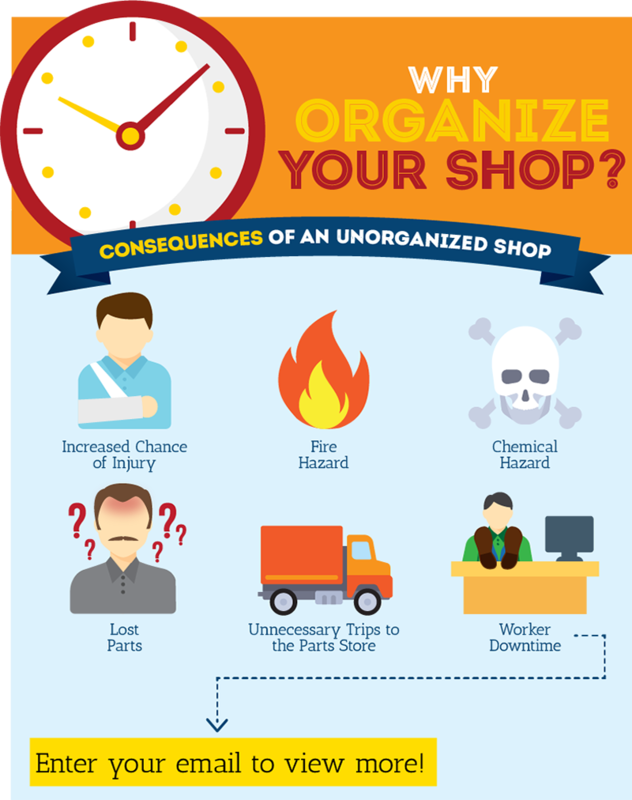 When you have an unorganized shop, it can cause problems ranging from bad moods to lost profits. Although the process of getting organized is daunting, the benefits are abundant. Tripping, slipping, stumbling: They can cause cuts, bruises, broken bones, or worse. When a shop is in disarray, it’s hard to say what you’ll – literally – run into. Chemical storage is a top priority when working in potentially dangerous environments. A properly organized shop should include a chemical cabinet to keep dangerous substances away from an open flame and where they are less likely to be spilled. It’s also important to have a fireproof cabinet if your shop is required to meet such standards. A very costly consequence of a messy shop. When a project is at a standstill and everyone is left waiting, a lot of money can go down the drain. Not to mention, when employees aren’t working, your customers are left waiting, as well. Say, for example, that an employee who makes $30 per hour waits for the right parts to complete a task for 45 minutes. That costs the company $22.50 for no productivity. Now, imagine when this happens in your shop repeatedly and it includes many employees. Your bottom line will feel the crunch. Download the infographic below to find a chart that will help you calculate how much downtime might be costing your shop. Conversely, an organized shop presents numerous advantages. When everything has a designated spot in a shop, it’s easier to return parts to their spot. That means less chance of tripping and causing an injury. Also, when chemicals are properly stored, there’s a decreased chance of fire and contact injuries. Organization makes it so everyone knows where to find the right part when they need it. Employees spend less time searching for parts and going to the parts store. While overstocking can cause clutter, understocking could result in downtime. An organized system helps ensure proper inventory levels at all times and will allow you to see if you’re running low on a part. A chaotic environment can lead to stress and frustration. With a shop that’s in order, you can rest assured that you’ll be able to find what you need when you need it. It’s no secret a shop that runs efficiently will be a better place to work, which leads to increased productivity and worker satisfaction. When your shop is a well-oiled machine, it is more likely to attract customers due to the improvement in customer service.